KJong Uganda Safaris Ltd unveils to you the most enchanting African Safari covering two best destinations in East Africa. This takes you through the Pearl of Africa-Uganda and The Land of A thousand hills-Rwanda. The two countries hold the largest gorilla population size for your memorable and life time experience. Book with us our 18 days Uganda and Rwanda wildlife safaris as discover the greatest natural wonders of Uganda and Rwanda not to forget with two time of Gorilla trekking experience in Bwindi Impenetrable National Park and Parc Volcanoes Uganda and Rwanda respectively hence experience trekking Gorilla from two different countries, all in our Uganda and Rwanda wildlife safaris. This morning, we start our 18 days Uganda and Rwanda wildlife safari with a speed boat cruise on Lake Victoria to Ngamba Island, a sanctuary for chimpanzees. We learn about one of our closest relatives, the chimpanzees and also about the work that is done on the island. We can see the chimpanzees at close range; watch their behavior and their playfulness. We also observe one of their daily feedings. It is a real treat to see the chimps in this comfortable and intimate setting on Ngamba Island. In the afternoon, we return to Entebbe and make our way to Mabira Forest Reserve where we can enjoy the lush surroundings. Here you can relax at your Eco Lodge or take a pleasant hike in search of primates and bird life in the later afternoon hence marking a great start on our Uganda and Rwanda wildlife safaris. Overnight and dinner at Rain Forest Eco Lodge (Lodge facility) or Paradise hotel jinja (Budget facility). Meal plan: Breakfast, Lunch and Dinner. Today we drive to Ziwa Rhino Sanctuary. An experienced ranger will lead you on a trail to trek the Southern White Rhinos. Our 18 days Uganda and Rwanda wildlife safaris to Ziwa Rhino Sanctuary will enable you learn a brief history on how Rhinos were hunted to extinction from Uganda in the late 1970’s and early 1980’s and how they are being re-introduced with in the long term goal of seeing them once again roam the grasslands of Uganda. It is a truly fascinating experience seeing these Southern White Rhinos up close. Ziwa Rhino Sanctuary is currently habituating up to 21 Rhinos, having finished Rhino trekking, we continue to Masindi. Overnight and dinner at Masindi hotel (Lodge facility) or Ziwa rhino Bandas (budget facility). Meal plan: Breakfast, Lunch and Dinner. Our Uganda and Rwanda wildlife safaris will enable you See and feel the rage and thunder of the magnificent Murchison falls from a close range, enjoy a picnic lunch from the upper view of Murchison falls, before they flow into the Victoria Nile. In the afternoon, enjoy a Nile boat journey with great bird life viewing. 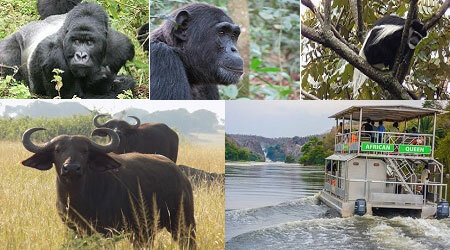 Hippos and crocodiles are also common here and we keep a lookout for primates. Our furthest point on the river is the base of Murchison Falls hence get to view the Murchison Falls from below, giving us a different view of the falls. We return by boat to our lodge overlooking the Nile for dinner and a relaxing evening. Overnight and dinner at Nile Safari Lodge (Lodge facility) or Red chili camp site (Budget facility). Meal plan: Breakfast, Lunch and Dinner. Set out on your morning safari game drive on our 18 days Uganda and Rwanda wildlife safaris hence take a ferry to cross the Nile before searching for African Elephants, African Lions, Giraffes, Hippos, Baboons, several species of primate, numerous types of antelope and of course, excellent birding opportunities. Lunch back at the lodge. Enjoy an afternoon boat journey along the Nile to the delta, passing hippos in the water, and gliding past riverbanks teaming with bird life. At the delta, keep a watchful eye for the massive but elusive shoebill. Overnight at Nile Safari Lodge (Lodge facility) or red Chili Campsite (budget facility) Meal plan: Breakfast, Lunch and Dinner. Enjoy another morning game drive in Murchison Falls National Park to view the wild inhabitants who make this place their home. The park itself is part of the Great East Rift Valley after our safari, we return to our lodge for lunch and enjoy a free afternoon to relax, gaze out over the Nile from your luxury tent or relax by the pool, while surrounded by jungle as we enjoy our Uganda and Rwanda wildlife safaris. Overnight at Nile Safari Lodge (Lodge facility) or Red Chili campsite (Budget facility). Meal plan: Breakfast, Lunch and Dinner. We begin our 18 days Uganda and Rwanda wildlife safaris with a long drive to the mountainous tea plantation area of Kibale. As the elevation increases, the scenery becomes ever more spectacular. Pass by the many tea plantations, small rural towns and several crater lakes. Overnight and dinner at Ndali Safari Lodge (Lodge facility) or Chimp’s Nest (Budget facility) Meal plan: Breakfast, Lunch and Dinner. 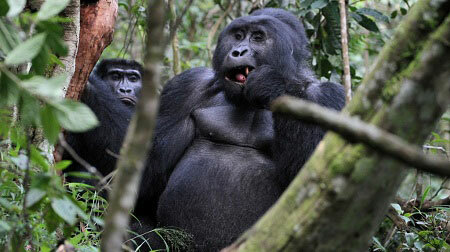 In the morning, we set off for Kibale forest national park to enjoy one of our great ape encounters. We hike in Kibale Forest National Park and have a rare opportunity to see chimpanzees in the wild truly a special experience we encounter on our Uganda and Rwanda wildlife safaris. Enroute, we may see other inhabitants of the forest. After lunch, enjoy a swamp walk, where you  may  see other primates and various bird species. Overnight and dinner at Ndali Safari Lodge (Lodge facility) or Chimps Nest (Budget facility) Meal plan: Breakfast, Lunch and Dinner. Our 18 Days Uganda and Rwanda wildlife safaris starts with breakfast then drive to Queen Elizabeth National Park. We enjoy our lunch at a hotel overlooking the Kazinga channel. We explore the Kazinga channel by boat, gliding past the banks full of Birds, African Buffaloes, Hippos, Crocodiles, African Elephants and other park inhabitants. Dinner and overnight at Mweya Safari Lodge (Lodge facility) or Ihamba Safari Lodge (Budget facility) Meal plan: Breakfast, Lunch and Dinner. Our Uganda and Rwanda wildlife safaris starts with a morning game drive along the Kasenyi trail then depart for Ishasha in the southern part of Queen Elizabeth National Park. Ishasha is known as the region where you can find the rare tree-climbing lions. Our drives are in the park so we can enjoy wildlife viewing while traveling to our next destination. Overnight and dinner at Ishasha Wildness Camp – luxury tents on the banks of a river (Lodge facility) or Savanna Hotel Kihihi (Budget facility). Meal plan: Breakfast, Lunch and Dinner. Our 18 days Uganda and Rwanda Wildlife Safaris begin with an early breakfast hence getting ready for gorilla trekking, which begins at 8:00 AM with a briefing from the UWA staff. On our Uganda and Rwanda wildlife safaris ensure to carry along with you a rain jacket, drinking water, snacks, jungle boots etc. The guides will lead you inside the jungle to see the endangered Primates for a group you have been booked for, do not forget to take your lunch boxes and all the necessary gear to track the rare Mountain Gorillas, perhaps one of the most exciting wildlife experiences on earth. Tracking the gorillas may take between 2 and 6 hours but it’s well worth the effort. Overnight and Dinner at Buhoma Lodge (Lodge facility) or Bwindi view Banda (budget facility). Meal plan: Breakfast, Lunch and Dinner. Our last day in Bwindi impenetrable national park is dedicated for a forest guided nature walk that enables you exploit Bwindi’s different Tree species, Butterflies species, Plant species, Bird species and Waterfalls or relax at the lodge, or do some curio shopping all of which can be organized during day time. Dinner and overnight at Buhoma Lodge (Lodge facility) or Bwindi view Banda (Budget facility). Meal plan: Breakfast, Lunch and Dinner. Hence making our 18 days Uganda and Rwanda Wildlife Safaris most interesting. Our Uganda and Rwanda Wildlife Safaris will start with an early breakfast then depart for a day of mountain gorilla tracking. 18 days Uganda and Rwanda wildlife safaris offers gorilla trekking option from both countries so as to compare gorilla trekking activities from Uganda and Rwanda. You will be transported by vehicle to the starting point at the ORTPN offices, to meet your gorilla mountain trekking guide. A short briefing will follow by either a transfer, or a walk, to the allocated gorilla family. As with Bwindi in Uganda, the hike can vary in length and terrain, but be prepared for an average of 3-4 hours hiking, plus of course the hour spent watching the gorillas. Return to the lodge for a hot shower and to relax! Overnight and dinner at Mountain Gorilla View Lodge (Lodge facility) or Kinigi Guest house (Budget facility). Meal plan: Breakfast, Lunch and Dinner. Drive to Kigali city, the capital of Rwanda, the roads are good, but quite busy with pedestrians! The rest of the day in Kigali and we will have time to visit the Genocide Museum, as well as other historical sites of interest hence making an end to our 18 days Uganda and Rwanda wildlife safaris. Overnight and dinner at Kigali Milles Collines Hotel (Lodge facility) or Okapi hotel(Budget facility) in Kigali Meal plan: Breakfast, Lunch and Dinner.